Home > Tulipmania: An Overblown Crisis? Historians have overplayed the extent of the moral, social and economic impact of the 17th-century craze for trading tulip bulbs. The original Dutch sources reveal a much more subtle cultural turning point behind its collapse in 1637. 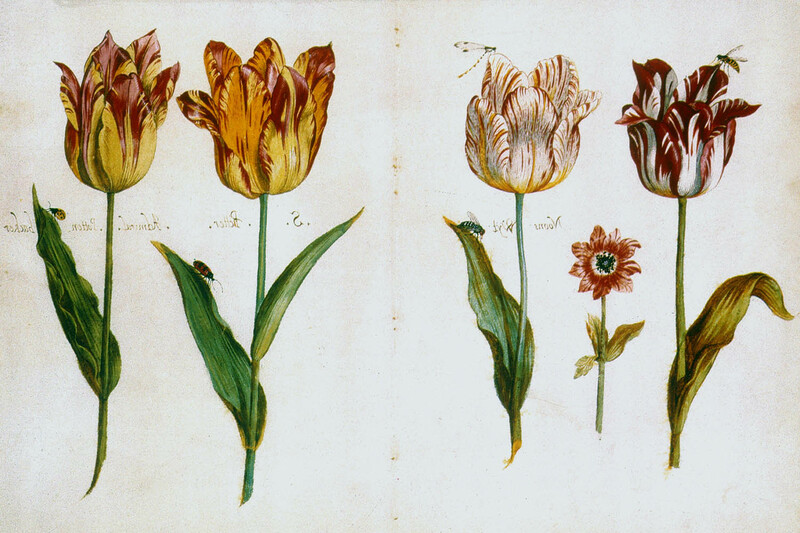 Three tulips and an anemone by Jacob Marrel (1614-1681). It might have been the combination of rarities and the accoutrements of a tavern that made the Menniste Bruyloft a place of resort for bloemisten, as tulip buyers and sellers were known in the 1630s. Taverns were frequently the sites of business as well as meeting-places of those with similar interests. Many of those interested in tulips were the sort of people Theunisz knew: members of dramatic and poetic societies (rederijkerskamers), the musical, the artistic, collectors of natural and man-made rarities. Taverns in various towns in the province of Holland, such as the Toelast in Haarlem, were known as centres of tulip-trading, and although many transactions also occurred in private houses or in front of notaries, the Menniste Bruyloft was frequently the scene of tulip deals. On the night of Friday 6 February 1637, for example, according to a witness, 'various persons and Bloemisten' were gathered in the Menniste Bruyloft when the Haarlem cooper Andries de Busscher put a pound of Switser (striped red and yellow) tulip bulbs on sale. 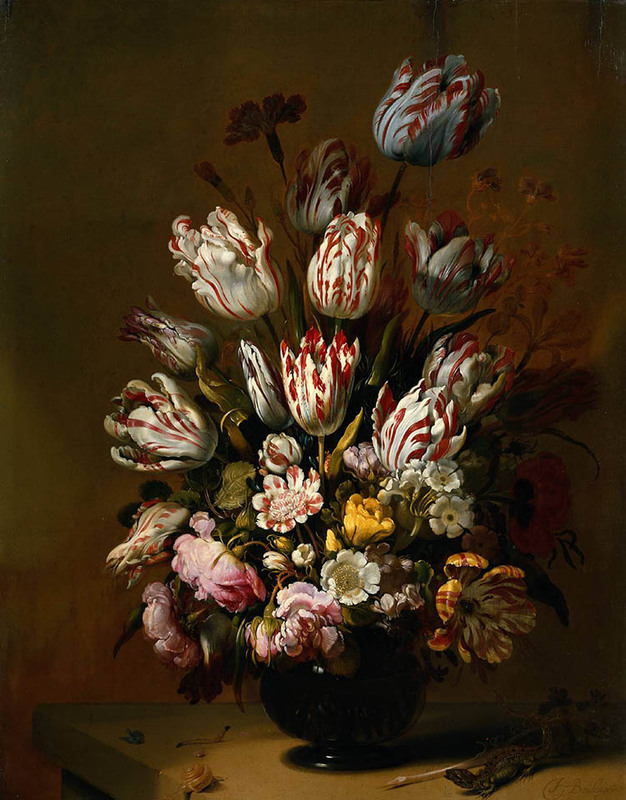 De Busscher, 31, came from a family of art collectors and was evidently himself a connoisseur of tulips; at least one tulip, a purple and white-striped specimen, was named for him in the period. The auction in the tavern concluded successfully for De Busscher; the 29-year-old Amsterdammer Joost van Cuyck bought the Switsers for 1,100 guilders (about the price of a reasonably nice house) on the condition that De Busscher provide security for delivery of the bulbs. This was because, it being February, the bulbs were at this point planted in the ground and, as was customary, would not be delivered (or paid for) until they had blossomed in June. At the same time, De Busscher asked for security from Van Cuyck that he would really pay the f1,100 when the time came. The danger for the past few months had been more for the buyer than the seller; with a rapidly rising market, sellers frequently ducked out of the deals they had made with buyers when they realised that in the future they could get a better price. However, at this point both parties were in agreement. Witnesses later testified that Van Cuyck had certainly bought the bulbs. One, Johannes van Westrenen, told a notary on the 11th that he had actually shaken Van Cuyck's hand on the occasion and wished him joy of his purchase; Van Cuyck, meanwhile, had thanked him and paid out a buyer's fee, wijnkoop (wine money), to pay for drinks for those in the tavern, as well as two shillings for the poor: all usual signs that the deal had been satisfactorily concluded. But this satisfaction was short-lived. Indeed, when Andries de Busscher tried to finalise the deal on the following morning, Joost van Cuyck was evidently already feeling a trifle queasy over the money he had just promised to pay. 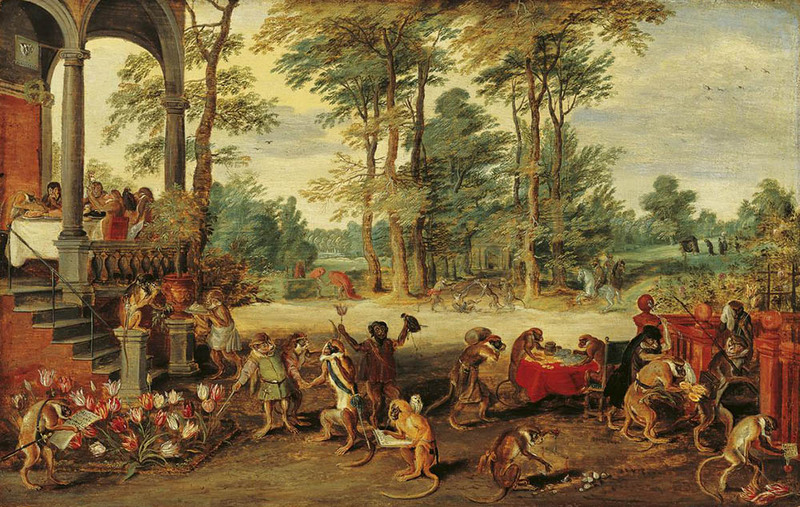 De Busscher had approached his brother-in-law, Alister van de Cruijs, at the open-air commodity exchange to stand as security for the delivery of the bulbs, but when they talked to Van Cuyck things did not go so well. 'I am not content with the guarantor,' Van Cuyck said; 'I want to find a guarantor of my own liking'. Even though Van de Cruijs promised f1,200 as security, Van Cuyck said 'I need to think about it'. That Van de Cruijs, Van Westrenen, and other witnesses appeared before notaries in Amsterdam and Haarlem over the next days tells us that despite his promises, despite his paying of wijnkoop and alms, Van Cuyck was wriggling out of the deal. Why was this? The dates give us a clue. By the time the auction was taking place in the Menniste Bruyloft in Amsterdam, doubts about the tulip trade were already surfacing in Haarlem. It took some time for these doubts to reach other towns. On 3 February a tulip sale in Haarlem had not gone as expected, but on the 5th in Alkmaar officials of the Weeskamer (Orphans' Chamber) held an auction famous for its high prices; if the tulips had been paid for, they would have garnered f90,000 for the orphan children of Wouter Bartholomeusz Winckel. Buyers from Haarlem participated in that sale, so evidently they, like those buying in the Menniste Bruyloft on the 6th, did not yet know about what was being said in Haarlem. But by the 7th bloemisten in Utrecht were meeting to elect representatives to a meeting in Amsterdam to discuss the crash. And by the 7th, as well, Joost van Cuyck clearly had heard about the sudden fall in prices. In such circumstances he was not going to honour the purchase of a bulb worth much less than the amount he had promised to pay. Already domesticated in Turkey, tulips came to Europe in the 1550s in the luggage of interested collectors at the imperial court. Their novelty and exoticism ensured their appeal. By the 1570s, the flowers reached the Netherlands both as a result of trade and humanistic exchange. Here, an excited circle of humanistic botanical enthusiasts, including figures like the botanists Carolus Clusius (1526-1609) and Joachim Camerarius (1500-70), corresponded about tulips throughout Europe in the later 16th century. As collecting became more fashionable in the northern Netherlands in the early 17th century, rare flowers joined art and other curiosities as the possessions of a cultivated person. As flowers became fashionable, their prices also rose. ... at the beginning of February 1637, Holland was awash with ecstatic paper millionaires. Their lives as weavers and carpenters were behind them. Some ordered horse-drawn carriages; others were shown respectfully round country estates: others negotiated contracts on sumptuous canal houses. Overall, then, the available secondary works on tulipmania remain remarkably consistent in the messages they convey. Tulipmania was a sort of temporary insanity, a misvaluing of the worthless as something precious. Tulipmania engulfed the whole country, rich and poor, men and women, urban and rural. Tulipmania was a nightmare for society, engendering a frightening social mobility driving industrious weavers from the loom and sober merchants from their chosen trade. Tulipmania proved a disaster for the economy, bankrupting thousands and disrupting the economic stability of Holland and indeed the whole country. We repeatedly hear the same stories. A fortune is lost when an ignorant visitor ate a tulip bulb. A long list of goods, headed by four fat oxen, is equal to the cost (for some writers, actually is the cost) of one bulb of the Viceroy variety. Bulbs are said to have changed hands hundreds of times in a frenzy of financial madness. And of course there are the ever-present weavers, abandoning their looms and instead feasting, drinking, and riding around the countryside in carriages. They were not interested in flowers – unlike the 'good' connoisseurs of tulips – but, we learn, simply in unsavoury profit. This image of folly and disaster has always stood as an emblem for the consequences of misplaced ideas of value and the overreaching of a prosperous society. Yet the idea that tulipmania should carry any kind of moral should make us suspicious about our sources. A closer examination of the archival evidence – evidence which, surprisingly, has barely been looked at in all these years of accounts – shows a great discrepancy with the usual tales of tulipmania. In fact, virtually none of the traditional story of tulipmania is true. One of the constantly repeated myths about the 1630s is that the whole country, rich and poor, became engulfed in a passion for tulips. Although it has not been possible to identify everyone in the cities I have studied who took part in the tulip trade, I have located around 285 people in Haarlem (mentioned at the time as the centre of the trade) who bought and sold tulips out of a population of about 42,000. In Amsterdam (at that time with a population of about 120,000), I found 60 buyers and sellers, although if judicial evidence had survived this would no doubt have been higher. In Enkhuizen, with around 22,000 people, I have found 25 involved. Although these are underestimates of the true total, we can be relatively confident that the numbers involved in tulipmania were relatively select. Indeed, the same names come up in different contexts, and many were easily identifiable and often substantial citizens, although not, for the most part, in the governing class. So tulip trading did not involve everyone; and more than that, the people it did involve were not randomly chosen. Far from being an indiscriminate social group, they were in fact connected to each other. Many of those involved were closely related to each other, tended to live close to each other, shared the same professions, and, especially in the case of the Mennonites, a plain-living Protestant sect, had religions connections to each other. This says more about the way information circulated in this society – through families, neighbourhoods, churches, or trades (such as baking, innkeeping, and shopkeeping) involving significant contact with the public – than providing a moral spectacle of an entire society gone mad. The idea that tulip trading was confined to certain circles leads us to a related point: what about the weavers who so picturesquely populate this story? The folly of the lower classes, certainly unsuitable for high-level financial speculation, losing their shirts in the crash is emphasised by most writers on the subject. Yet once again, when we turn to the archival evidence, we face a surprise. Weavers and other lower-level artisans barely feature in the documents; most come from the solid middle classes of merchants and master craftsmen. Although the cloth trade was prominent in this event in Haarlem, it is on the level of merchants and contractors, not among the poor weavers, that we find bloemisten. Even the most famous anti-tulip pamphlet series of 1637, the dialogues of Waermondt and Gaergoedt, speak of master craftsmen with journeymen and substantial workshops, not impoverished pieceworkers. So it is hard to see the wholesale social mobility envisaged by most writers. Nor was it the case that the crash led to dramatic hardship. 'Substantial merchants were reduced almost to beggary,' wrote Charles Mackay in his famous Popular Delusions and the Madness of Crowds of 1841, a widely used source for more modern accounts of tulipmania. But there is little primary evidence that the tulip craze did any such thing. Although the bankruptcy records for this period are patchy, it is difficult to find any bankrupts at all associated with tulipmania. Francisco Gomes da Costa of Vianen fell into severe financial difficulties in 1646, but the whole reason he was living in Vianen was that he had already gone bankrupt years before the tulip crash, and had escaped to the protection of that free city. A few others who bought and sold tulips went bankrupt in the late 1630s, but in most cases it seems unlikely to have had anything to do with tulips. The place in the bankruptcy records where we find many people involved in the tulip trade is when they are buying up the houses of other people who really were in financial difficulties. Many bloemisten made bids in Haarlem bankruptcy sales, and others can be seen in the period after 1637 buying houses and gardens, setting up new companies, and bidding on paintings in art auctions in Amsterdam. The general impression is of relative financial health. (Jan van Goyen, who admittedly died bankrupt many years later, engaged in real estate speculation that took much more from his pocket than tulips ever had.) Although it is possible, as contemporary songs from the rederijkerskamers suggest, that artisans found themselves in financial difficulties at this time, there is no evidence of it in the archives, including no expressions of concern on the part of the city governments or the church. We also do not find the 'prolonged depression' after tulipmania cited by Malkiel. Though economic historians argue about when there was a depression in this period, most agree that the Dutch economy continued to grow until the mid-17th century in nearly every area: industry, overseas trade, living standards of the population. If tulipmania affected this situation at all, it would only have been in a minor way. This is much less surprising when we consider the relatively small group of those involved in tulip trading. Even fewer would have been hurt by the crash since – because people buying in January did not have to pay until May or June – the only people who lost money would have been those who actually had bulbs in their possession. And many of these could afford to take the loss. In the first place, the legendary prices were not so insane after all. It is true that some prices for some tulips jumped radically over a short period following the planting season of autumn 1636, especially in January 1637. If we look at comparable prices for consumables for ordinary Dutch people, the price of the Switsers bought by Joost van Cuyck amounted to about three years' wages for a master carpenter in Alkmaar. However, the kind of people who spent large sums on tulips were not, for the most part, at the lower end of society. Of those I have found who spent more than f400 (a total of only 37 people), nearly all were wealthy merchants: in Haarlem, people like the brewer Abraham van Meeckeren or the merchant Bartholomeus van Gennep. On the whole the pattern is fairly uniform: the wealthier bloemisten were the ones who spent the most on tulips. And for many international merchants – the chief type of bloemist in Amsterdam – although f1,100 might represent a sizeable figure, it was hardly outrageous. The accounts of the Wisselbank (exchange bank) in Amsterdam give us a picture of constant movements of such sums, including by names familiar in the tulip trade. To take only one example, at the same time as the Mennonite merchant Jacob Abrahamsz van Halmael was pondering tulip deals, he bought, on 22 November 1636, a load of other goods worth a full f12,000, half of which he was able to pay for up front. Would f1,100 for tulip bulbs have seemed so much to him? But, one might argue, it was ridiculous to spend so much money on tulip bulbs at all. This argument, like many others made about tulipmania, comes to us directly from the songs and broadsides of 1637, which made moral judgements about what was a suitable way to spend one's money. The only insanity we can cite in tulipmania is a failure to foresee a crash; for in a rising market it is not insane to buy something that one can resell at a higher price. Some of the merchants who bought tulips were, in any case, interested in the aesthetic side of the flowers, in the pleasure and sociability of collecting and the culture it entailed. The location of the Menniste Bruyloft, with its collection of curiosities and erudite owner, suggests a crossover of aesthetic and commercial interests that had infused the fascination with tulips since their introduction to Europe in the 16th century. By the end of that century, we can already find an interest in a variety of rarities, as if a garden were an outdoor collection; and commerce, even at this early point, could not be excluded from tulip-collecting whatever the emphasis on reciprocity and exchange. If we look at 17th-century buyers of art at auction and buyers of tulips, we find many of the same names; and as the work of John Michael Monlias suggests, the sociability of connoisseurs of art will have had consequences for the sociability of connoisseurs of tulips. Given the importance of communication in this trade – and we can see that discussion led to a community of expertise within the world of bloemisten – the kind of atmosphere an inn like the Menniste Bruyloft would have provided would have helped to bring together those as interested in rarities as in profit. If the evidence we find in Dutch archives does not confirm the story of tulipmania as a financial crisis, it can still teach us much about the way that knowledge was transmitted, the way that communities of knowledge formed and the way a new interest and a new trade might form its own institutions and ways of validating knowledge. In this case it is the identification of tulip experts and the empanelling of the collegie, a group of experts who ruled, if not with total authority, on disputes over tulips. But there are still questions to be asked about how tulipmania came to be seen as such a crisis. Modern accounts quite clearly owe their views and even their stories to popular songs and pamphlets emanating chiefly from the rederijkerskamers, and thus providing a commentary from the lower-middle to middling classes. These have passed through a number of easily identifiable sources into more recent books on the topic. So what we get from most modern discussions of the tulip trade is, in fact, a specific 17th-century view – and a moralising one – of the dangers of luxury in the wrong hands and consisting of the wrong things. But if the problems outlined in these books did not occur, why was anyone upset about tulipmania, even in the 17th century? One answer comes precisely from the ideas of community and sociability mentioned earlier. The confrontation of Andries de Busscher and Joost van Cuyck on 7 February 1637, gives some indication of why, though no major financial crisis, tulipmania was a crisis nevertheless. The Menniste Bruyloft was a place of resort of people involved in what was a relatively small community, though one that had its intercity dimensions. One tulip buyer in Enkhuizen, Ellert Fockesz van Resum, even turns out to have been the father-in-law of the owner of the Amsterdam inn. The bloemisten, as one witness mentioned, would have been, in the main, known to each other. Andries de Busscher brought a close relative into the transaction – as was normal at the time – to make the deal complete. Van Cuyck went through a series of rituals – shaking hands, paying wijnkoop – to make it clear that he had bought the tulips concerned. Yet despite the invoking of communal norms Van Cuyck still reneged on his transaction. ... involving notable sums of money, to be delivered when the bulbs were suitable to be taken up out of the ground, and to be paid cash: which everyone, in good faith, had promised each other: and also made written contracts and firm bonds to do so, signed by both parties ... Despite all this, no one out of all those with whom he [Jansz], the witness, made a contract, has completed the sale nor received any bulbs: much less paid anything or given any satisfaction. Even if people like Adriaen Jansz or Andries de Busscher could afford to lose the money they had hoped to gain, it might take them much longer to come to terms with the trust they had seen broken. This was a society built on foundations of credit and trust. It was built on a certain social hierarchy, and although things were gradually changing, it was not difficult for contemporaries to imagine a much more rapid change into a society in which no one knew each other's identity or trustworthiness. If that happened, not only trade, the foundation of this society, but all other social interactions would be affected. This is what was behind the comments about social mobility, a social mobility that did not for the most part take place, and this was what was behind the shock of tulipmania. The crisis might not have been a financial one, but it was no less a crisis for being cultural. Anne Goldgar is Professor of Early Modern History at King’s College, London and the author of Tulipmania: Money, Honor and Knowledge in the Dutch Golden Age (2007). This article originally appeared in the June 2007 issue of History Today.